This newsletter will be published 8-12 times a year. It will focus entirely on anti-nuclear events and tools happening all over the world. We strongly believe in citizen's actions en hope to inspire you all to engage in activities organised by grassroot groups and NGO's all over the globe. Feel free to share this newsletter. 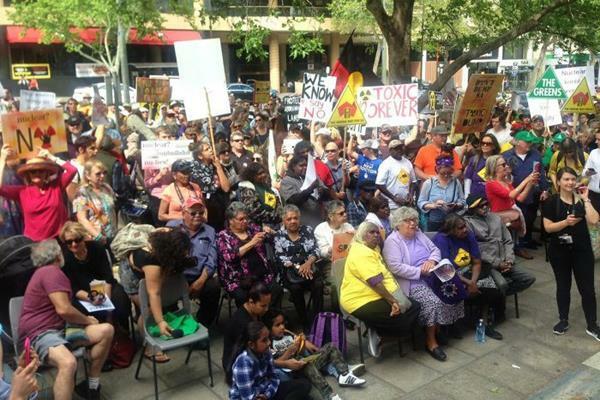 About 3.000 protestors rallied at Parliament House in Adelaide on October 15th against proposed nuclear waste dumps, with Aboriginal families affected by nuclear testing at Maralinga among the crowd. The Aboriginal Traditional Owners are facing a push for an international high-level nuclear waste dump on their homelands. 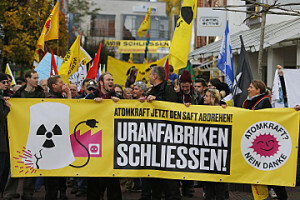 Around 700 people demonstrated on October 29th in Lingen, sending a clear mesage of the necessity of immediately phasing out nuclear energy. In Lingen fuel rods are made for nuclear power plants. 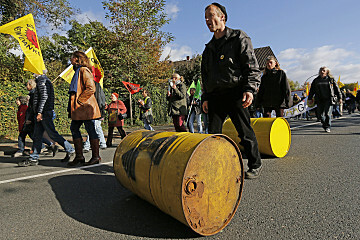 Also for the Belgium nuclear power plants, which the German goverment wants to see shut down. But they still make the fuel rods... see the irony here? Read more about the demo on the BI-Luechow Dannenberg website. 'Power Struggle' Movie. Documenting the fight to close Vermont Yankee Power plant. There is a screening tonight, November 3rd, in Vermont or check out the trailer here. 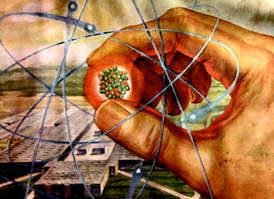 The atom: a love affair. A feature documentary revealing our seven-decade relationship with history's most controversial power source. Screening on the 1st of December in Workingham, UK. Containment: can we contain some of the deadliest, most long-lasting substances ever produced? Screenings worldwide until March 2017. 10 November: Exhibition of Hiroshima 50. In Sao Pauolo, Brazil. More info. With a seminar on the 11th and 12th of Nov.
Talks and films, Fremantle, WA, Australia. By the West Australia Nuclear Free Alliance. Don't forget to check out the movie screenings above. Are you organising an anti-nuclear event? Get in touch with us! Endorse the statement with your organisation from The Aboriginal Traditional Owners. For US citizens: Tell the Next President: Act Now for 100% Clean Energy. Endorse the joint appeal opposing the India-Japan Nuclear Cooperation Agreement. 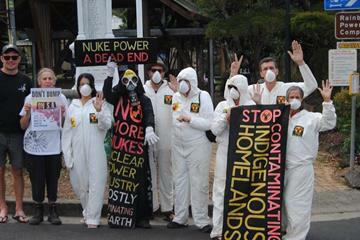 Action in Nimbin against nuclear dumping. 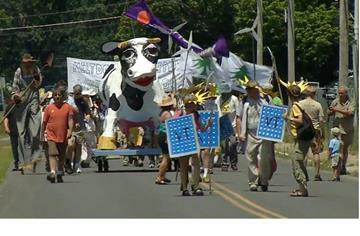 Documenting the fight to close Vermont Yankee Power plant.